Our home is supposed to be our refuge, a place to feel refreshed and reenergized. While we enjoy puttering around the house, hoping to make our home a cleaner, safer, more beautiful and comfortable place, studies have shown that the average household contains approximately 62 known toxic chemicals due to products we bring into our home! Recently a research study from George Washington University also found that 45 toxic chemicals are commonly found in house dust! My goodness! If toxic chemicals are in our house dust, I can’t even imagine how many must be building up in our bodies. That might inspire us to dust more, but even more importantly, we need to feel inspired to get the chemicals out of our house. These chemicals most certainly have an effect on our health, whether we realize it now or not. I always remind myself, though, that there is no need to be fearful because there are things we can do right now to begin to eliminate the chemicals in our home and make it a safer place for our family. Tomorrow I will share a personal story and some very eye-opening things that have been motivating in our own journey toward creating a healthier less toxic home. It can feel overwhelming to even know where to start to get rid of all the unhealthy substances in a home, but what I’ve been working on and what I encourage you to do is to just dive in by replacing those chemical-filled every day products with cleaner alternatives. Even just one step at a time. It’s so easy and cost effective to make your own household cleaners, too! I’ll share more DIY recipes and the changes we have made in our home in the coming weeks, but today here is a super simple way to keep a shower fresh and clean without the yucky chemicals. All you need for a daily shower spray that will keep the soap scum away! Mix it up in a glass spray bottle and spray your shower every day! You don’t need to wipe it off. You can find the 100% pure therapeutic grade essential oils we use here. 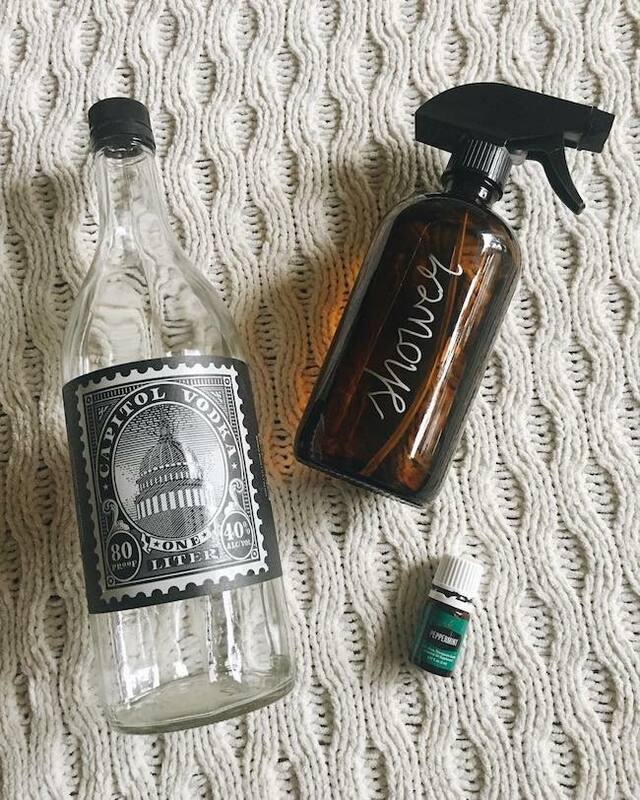 You can find a similar spray bottle like the one in our photo here. We found this recipe a couple of years ago from Clean Mama. She has a great book called The Organically Clean Home and has lots of helpful recipes for organic cleaning! 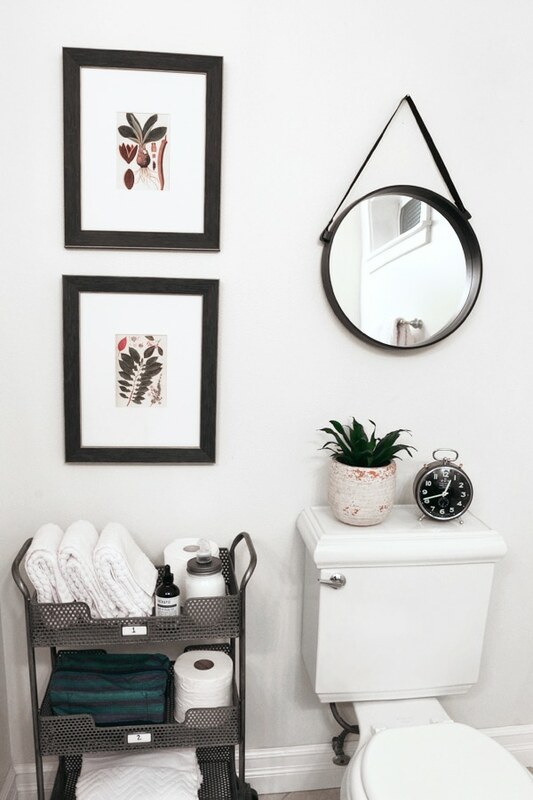 See this post with more simple changes for a cleaner home! I’m curious……does this have to be in a “glass” spray bottle? That’s my question too. Glass in the shower area doesn’t sound safe for our house. Plastic bottles can leach chemicals so I prefer glass (especially with essential oils). 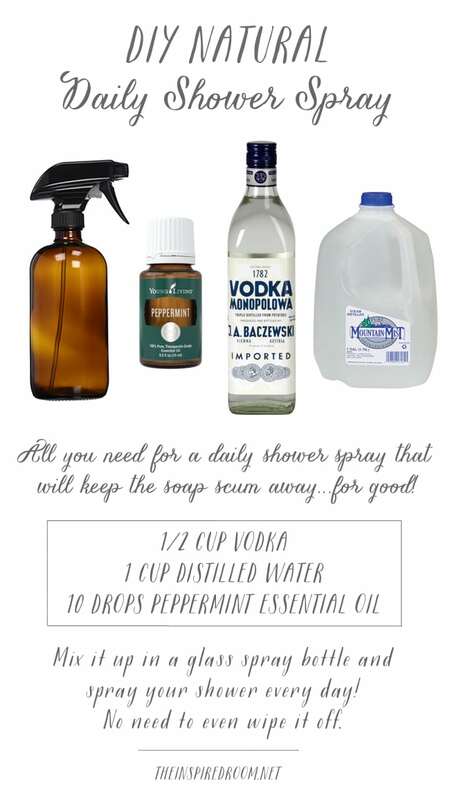 Love your posts Ann…..I have been using a shower spray every day….I would substitute White Vinegar for the Vodka! I prefer to drink my Vodka!!!! White Vinegar, Distilled Water, & choice of Essential Oil does work wonder in the bathroom! I really like this idea and have essential oils at home. Why use peppermint in particular? We’ve been using this recipe for awhile and it just happened to be the oil that was suggested so I just stuck with it! Peppermint is super refreshing and has antibacterial properties so it’s great in a bathroom, but it’s really personal preference. It’s fun to mix it up and try different blends for different purposes or rooms of the house. I can’t wait until this evening when I tell my husband I need to go buy some Vodka to clean the shower. But, Really, I am going to try it. Thanks. Thank you for the shower spray recipe! I am currently moving and will definitely be using this is my new house! Sounds like a simple solution to a huge problem. Creates another problem for me, who won’t buy alcohol or be found in the aisle for appearance sake. Since vodka is essentially 100 proof alcohol, I’m guessing store shelf alcohol would be as effective? I don’t think they are the same, the store bought rubbing alcohol is isopropyl alcohol, which I would think would be toxic for cleaning. I haven’t researched that. But you can try different methods, vinegar is another option as a substitute. I would suggest experimenting or researching what is best for your type of shower or surface too. Vinegar could etch marble, for instance. I am a 3 year cancer survivor and I have changed to all natural cleaners. I clean homes for a living so I use a lot of products on a daily basis. I figured this was one way to help myself and my customers. Congratulations, Beverly, on your 3-year anniversary. Best wishes for many, many more. I’m SO glad you are doing well, Beverly! Thank you for sharing. I think it’s wonderfulthat you use natural cleaners for your own health and your customers, too! Do you think this would work with keeping hard water stains away? Or is it just good for soap residue? Oh. My. Goodness. You have just solved a major problem for me. We have cultured marble tub & surround in both bathrooms. (Vintage 80’s, neutral beige, no $$ to update). I’ve been at my wits’ end how to clean the stuff and was finally surrendered to diluted vinegar which I already know is bad (but the toxic cleaners are a much worse bad, so out of the question). Quick search shows me that I CAN use this on our cultured marble AND on our granite counters in the kitchen. THANK YOU! I will definitely give this a try. I am just starting to get the toxic chemicals out of my home, but it feels a bit overwhelming to me at the moment. In fact, I had two boxes of cleaning products that I had to take to our city’s service garage for safe disposal due to their hazardous ingredients! That was an eye opener for sure. I was diagnosed with asthma so I need to be careful about the products I am using. I look forward to reading more of your story and suggestions. I’m sure it will be helpful. Is this DIY shower spray safe for natural stone showers? I have showers made of various stone—slate, travertine, small stones (not pebbles). I can’t use vinegar on them at all. Hoping the vodka would be OK. Thanks for sharing this, Melissa. I’m also working on detoxing our home this year, and hadn’t come up with a replacement for our shower spray … until now! This is interesting! We have a glass shower stall which we squeegee after each shower. Would this solution leave spots on the glass if not wiped down? It would be great to just be able to spray and nix the squeegee! Thanks! Then when you’re done cleaning you can drink it…… Especially when your family messes it all up again…..Just kidding. Never knew vodka was good for cleaning…. I’m so glad you’re addressing this. I’ve been on quite the health journey the past few years through chronic depression/anxiety, thyroid/auto immune disease and have learned a lot through the process. A great book that goes into food and personal care products/home care products and what to change is “A mind of your own” by Kelly Brogan. I highly recommend it. Learning how much all these things can affect our physical and “mental” health is life altering. Anyway! You’re my favorite blogger and it makes me so excited that you’re talking about this. And, yes! !…the bottle needs to be glass!! Thank you Rachel. I have had some similar issues over the years and have also found it life altering to learn about the things we can do and stop doing :). I’m happy to share, it’s such an important topic for everyone. I’m wondering if just plain rubbing alcohol could be used in place of the vodka in the shower cleaner recipe? We don’t drink, so… and from what I understand, vodka (even the cheap stuff) isn’t inexpensive. Distilled white vinegar might a better option, Jo Jo. I’ve been using a recipe similar to Melissa’s, but it calls for equal parts of this vinegar and distilled water. I then add 12 drops each of Tea Tree and Orange essential oils. This is my go-to, all purpose cleaner—in a spray bottle. I’ve been using it for about a year and a half and can’t be happier with it. I use it in the kitchen and bath, on glass and mirrors, and to clean the exterior of the washer and dryer, the inside of the washer. Yes, I agree on vinegar as an alternative (but be sure to check before you spray it on natural stone to make sure it won’t be a problem). Thanks for the great recipe, I have a similar all purpose cleaner I’ll share soon too! Thank for the catch, Melissa. I should have mentioned that this cleaner does work great on sealed tile (which we have in our showers and the floors in the kitchen and one bath). In our master bath we have unsealed floor tile, so I must use a different cleaner for it. Can I order JUST the peppermint essential orders without signing up for a membership/commitment? If not, would peppermint extract work? Hi Lisa, yes, you can order just the peppermint essential oil if you’d like! Fill out the required info to place your order for Peppermint Essential Oil. By the way, there is no commitment or membership to get the wholesale prices. They call that option a “membership” but there’s no fee or commitment at all. The only requirement to get the wholesale prices are that you start out with an order for a premium starter kit (which comes with Peppermint and 10 other oils plus a diffuser, by the way). Beyond that, no requirements to get the wholesale prices! But yes, if you only want the one oil you start with the “retail” account and get the peppermint essential oil. If decide later you want to switch to wholesale, just message me and I can help. Peppermint extract is not the same as the pure essential oil. Let me know if I can help any further! Thanks Lisa. Melissa, What would suggest for scrubbing the tub? And will this shower spray clear mold/mildew? We live in NOLA where the humidity can be off the charts and it’s a constant moisture battle…..HELP!!! Sounds like a good solution especially since vinegar leaves a sour smell and vodka none and the alcohol s better at killing bacteria. Have you ever tried this on sink scum? Hi Melissa, Thank you for this recipe. It looks great. You might also like to try this cleaner – http://www.livingareallife.com/naturalliving/27/11/2013/orange-cleaner?rq=orange%20cleaner. It’s so easy to make and it’s something to do with all those orange peels. What did you use to write the word “shower” on your bottle?? So cute! What would be the shelf life of this? ?